Well one time maybe 5 weeks ago I had a dream that I was singing on stage, I was singing an Epica song I think it was Chasing The Dragon, Then when I had finished (it was a big crowd btw) Sisi cam on stage and hugged me then Anette Anneke and Floor came on stage too I hugged them too Sisi talked to the crowd talking about how great I was, she then finished and I turned around and said "I love you Simone" and then everyone was crying because it was so emotional. I wish that was true!!! I had 4 Epica dreams so far that I remember. They all included Mark, and two of them also Simone but she disappears very fast anyway. I won't get it the details. Hmm. Useless post, sorry for that. Funny, I just had a dream that the local music lounge was having an event, and Epica showed up to play just as I got there. But, alas, I got an emergency call that I simply had to take, and as I hurried out feeling absolutely distraught that I was missing the show, I ran into Mark, who arranged for me to see the next show. Then I woke up, and, naturally, was very disappointed. I've had few Epica dreams lately, well no suprise since i havent thought of lot else . 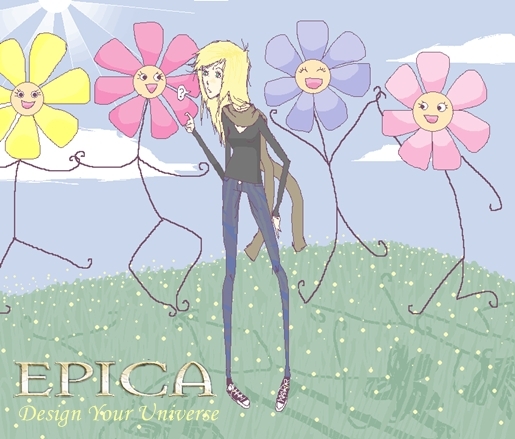 Another one was just me on Epica's myspace site, listening to the new songs and wondering them with my mom haha. I just remember they were heavy and awesome. Lately I had a dream that Epica was coming to Poland (to a weird city I do not know though and can't even remember the name now ) and I was planning the trip and all! I had a dream last night that I was at Epica show and Mark has short hair. I woke up and was so glad it's just a dream! He still looked cute though. It doesn't center around Epica per se, though I do remember in one dream I had a few weeks ago involving next to everyone name-dropping their music, even the people I least expected to know about the band. o_o Also, I swear that I saw Simone and she grinned at me... but I dunno. I have had A LOT of Epica dreams, so I am not sure where to start. Lately I have had a lot of dreams were Simone is pregnant, I have no idea why, haha... But I will be scared to death if she actually is! I once had a dream about Mark and Simone, and they signed up for The Amazing Race. I remember going crazy about watching the episodes with them. Wouldn't it be awesome if they actually did that? At some point, an old friend of mine (whom I haven't been in good relations lately) shot a pic of Simone and me, as well as one of Floor and me (separately.) I remember while she was taking that picture of Floor and me, Floor was moving around the same time and laughing but we agreed on the fact that was okay. Such a cool dream Elodie! I had a weird dream about Epica. I had the chance to sing a song with Simone, and I choosed for Unleashed. After when I was walking off the stage everybody was screaming to come back and all those things. After that, I became friends with every band member and every concert they had I had the chance to sing Unleashed. I wish that was true. But it was just a dream. It was beautiful, felt like almost real! And then I woke up. But I think I have to deal with the fact I will never sing with Simone, and that I will never sing in a band. Simply can't find one. So those classical lessons I will take are a bit money spenders. A while ago, I dreamt of Simone laughing at my side (not at me but sort of chuckling or sth,) waving back and forth a wig (that actually had her natural haircolour) with one of her hands and later on getting into an oven where a dish was being cooked. (If my memory serves me well, she was waving at me from there.) That was a weird dream!